If you want to be efficient with your content marketing you need to stop trying to reinvent the wheel and instead simply create more versions of the wheels you already own. For maximum reach and impact, play Blackout Bingo with each of your overriding content marketing concepts. 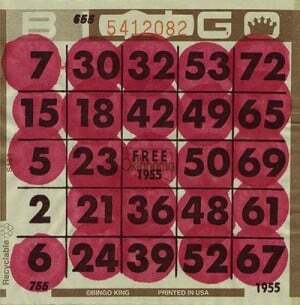 For those of you raised on video games who perhaps have not had exposure to the endless, plodding pleasures of live bingo, the variant known as “Blackout Bingo” dictates that you must cover every spot on your card to win (instead of the customary vertical, horizontal, or diagonal line). I want you to play the same game with your content marketing. I want you to win at Blackout Bingo. Content marketing success isn’t about more ideas, it’s about more executions of an idea. Step 1: Figure out what you major content marketing theme or concept is. This is your bingo “card”. Step 2: Consult the handy chart of potential content executions I have created for you. I left a few columns open so you can add your own if you have something specialized you might want to tackle like direct mail, or skywriting, or singing telegrams. These are your bingo “numbers”. Step 3: For each of your major concepts, find a way to repackage/reimagine/reconstruct them to cover as many “spots” as possible. How can you communicate the theme with photos? With short video? With a live stream? With an infographic? With an ebook? Step 4: Declare victory. A regulation bingo card includes 25 spots. I would love to recommend that you create 25 different executions for each content theme, but that might be a bit over the top, even for advanced practitioners. But if you can play and cover a 3×3 card (that’s one big idea, and 8 executions of it) let’s agree to consider that a Blackout Bingo success. Important note: To do this successfully you MUST devise the big picture ideas/themes first, and then think about execution opportunities. If you find yourself saying things like “what we need is an infographic that….” you are doing it backwards. Instead, you should say things like “An area where we can really help inform our prospective customers is….” and THEN (and only then) should you start considering the ways you can execute on that promise, on the way to Blackout Bingo.